Black Panther: King of the Jungle or Domestic Housecat? Black Panther is the latest entry in the Marvel Cinematic Universe, and the first to explore a superhero of coloured origin. Which makes this film both fascinating and powerful in new and definite ways. Seeing diversity on screen (Luke Cage is an excellent example) is always a positive, but when that diversity contributes to excellent film making, you have a work of art. Black Panther is a definite work of art. 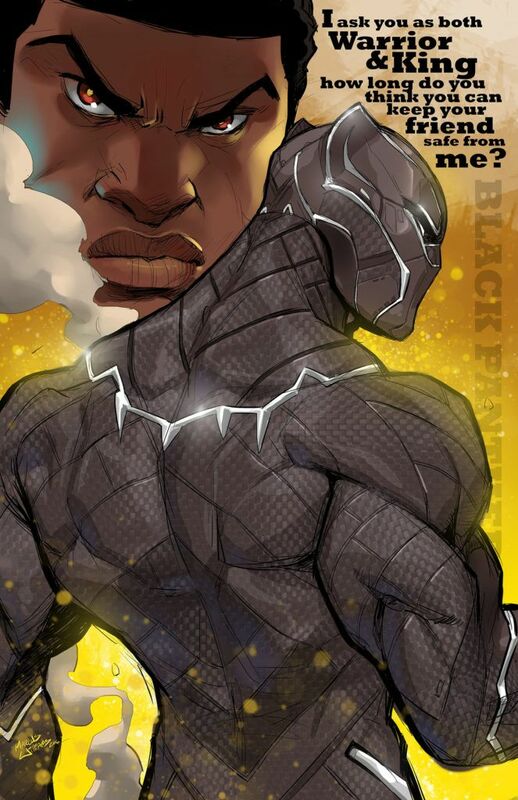 It follows on from the entry of T’Challa – the son of Wakanda’s king – into the Marvel Cinematic Universe. For those who may have forgotten, this was when his father was assassinated by the Winter Soldier in Civil War. Now, T’Challa must ascend to the throne, to be the head of all the tribes of Wakanda. And in his right as king, and his sense of responsibility to the world, lies the crux of Black Panther’s plot and moral dilemmas. Black Panther follows T’Challa as he begins the long process across the film of learning to be king. While Civil War certainly developed the beginnings of his character, here Marvel expands this role much further. Struggling with the requirements of leading all his Wakandan people, T’Challa must combat his personal desires against the needs of the throne. And against the needs and rituals of Wakanda’s past. The great struggle of the plot is one which gives great balance and importance to every character. The two key ‘anglo’ roles of Kaue and Everett Ross might appear ‘useless.’ However, these two roles help define the essential conflict between T’Challa and the antagonist of the film – Erik Killmonger. This conflict is the idea of Wakanda’s moral responsibility to the rest of the world. How can Wakanda sit back with its advanced technology? How can Wakanda hoard its healing, its weaponry, its power resources and do nothing for the rest of the world? And the weight of this question drives both protagonist and antagonist across the film. Black Panther is a different Marvel film for many reasons. Yes, it does contain that same note of formulaic expression. That rhythm and structure that the Marvel films flow around. However, this is a film which is far more content with expressing and exploring African culture and inequality than being a generic superhero film. This is a film focused on the themes and issues at its heart. And this is done through every single choice made to create this work of art. The key female leads are all excellent. Shuri, Nakia and Okoye all show that films can feature strong female characters without reverting to stereotypes. Or without turning the characters into male-types-with-female-characteristics. The three key roles are all powerfully feminine in their own right and brilliantly acted. The other roles are also incredibly well acted. Each actor conveys the particular set of emotions and desires which drives their character. Whether this is a sense of duty and honour, or a sense of responsibility, Black Panther is a masterpiece of character development. And on top of all of this you have the same level of mystique that drives characters like Batman. T’Challa’s hero identity has the gadgets, speed and strength needed to jump around and perform in some incredible action sequences. Marvel have created a living, breathing culture and country across Black Panther. And through this land, comes the fun and laughter of all previous Marvel films. Yet at the same time this is something new. This is a film which explores the important moral responsibility of kings and leaders. A theme which is never more potent than in today’s world. Black Panther is ultimately a superhero film of a different skin. A film full of diverse themes and which espouses a positive narrative. Ultimately Black Panther highlights that the resources we have at our disposal should be on offer to those in need. And leads the audience to consider: what do I have to give to others? The fact that a superhero blockbuster leaves viewers with this question is the hallmark of powerful art.